Custom laser etched beer mug - perfiect for weddings, retirement, and graduation. This 16 ounce beer mug features a brilliant starburst pattern in its bottom for a classic pint draft mug look. 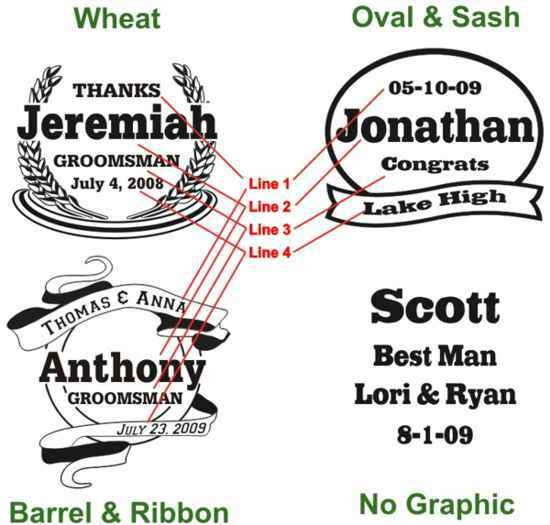 Engraving includes your choice of the stock designs pictured together with your custom text inscription. Each mug is individually boxed for easy gift giving. Each line may contain up to 13 characters and spaces! *Note:: Etching is done by laser engraver on face of mug. Learn more about precision laser glass etching and our glass etching services.